Yeah I probably should have folded that. Would you be defending any suited face cards? April 19, 2019 | 3:20 p.m. It was pretty early we had played just 20-30 hands with villain. Was just asking from a "chip ev" standpoint, I think vs this huge sizing we should start having a clear standard decision. April 19, 2019 | 2:11 p.m.
Its just a pretty easy call if you put it into ICMizer. April 19, 2019 | 12:54 p.m.
April 17, 2019 | 3:06 p.m.
Hand History | Risva10 posted in MTT: Ok cbet? April 17, 2019 | 2:56 p.m.
Hand History | Risva10 posted in MTT: Is this a defend 17BB effective 3way? 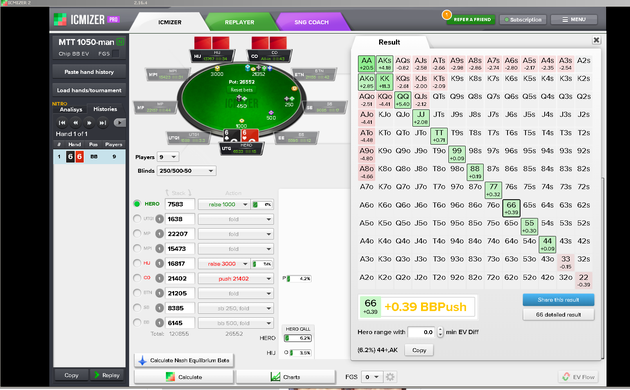 April 17, 2019 | 2:50 p.m.
Hand History | Risva10 posted in MTT: Recreational raising my 3x ISO 26BB effective. April 17, 2019 | 2:44 p.m.
April 17, 2019 | 2:38 p.m. Final Pot UTG wins and shows a pair of Eights. UTG+1 lost and shows a pair of Eights. April 17, 2019 | 2:32 p.m.
Do we really want to be 3bet calling AKo though? We are OOP we would be 3betting to like 8BB and if we go postflop the SPR will be less than 1.5 . If he was an agressive player I could see him shoving some 99,TT that he doesnt want to play postflop with, plus you can be applying pressure vs a LP open that you cover for the bounty. But genarally if you 3bet call I think you will end up vs a really strong range. Shoving there is really profitable anyway and we dont want to get in weird spots in a FT right? Also by shoving and taking it down you now cover 2 players so it shouldnt be that bad. I am not that experienced either with PKOs, just my thoughts. April 16, 2019 | 1:40 p.m.
C-betting too wide when deepstacked is definetely a common mistake at lower stakes. The OOP PFR will almost always take a 1/3 stab on a dry board like a 792 rainbow or a somewhat dissconected board like the one you used T52 2 diamonds etc. I think IP tends to raise less but call more than he should. How does that affect the EV of our hand and what strategy does it benefit? Cbetting wider, tighter? Maybe a different sizing does the job better. Would be a nice video theme. Anyway, Great stuff and nice explanations. April 14, 2019 | 5:55 a.m. Comment | Risva10 commented on Everything ok here? Folding to shoves right? Still I think a good player is just never bluffing that spot with that sizing. My hand is face up and he knows I am scared but can call a small bet. Maybe a spot to fold vs "regs".at these stakes. April 13, 2019 | 5:51 a.m.
Hand History | Risva10 posted in MTT: Everything ok here? April 12, 2019 | 2:35 p.m. I mean If you are right and he doesn't fold JJ,99,TT vs a turn bet I should be shoving a lot of rivers. Anyway you are probably right our line makes no sense. 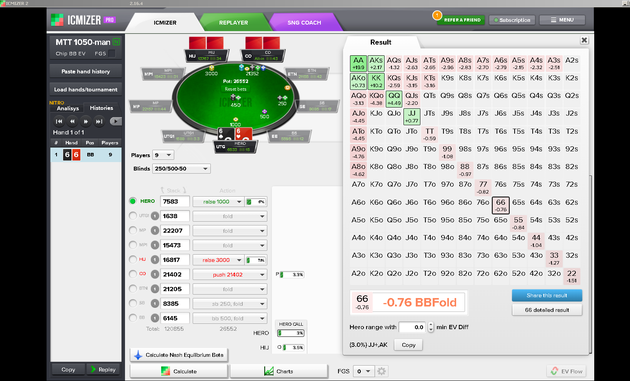 Coming back to my original question what flops are best to cbet on? Do you just hope no broadways come up when your 3bet a hand like this? April 12, 2019 | 2:27 p.m.
Just 3x OOP with 2 people in the pot? That definitely is too small, you would be giving the OR close to 4 to 1 and then the flatter wont really be able to fold. Especially OOP you wanna be sizing up. April 12, 2019 | 2:24 p.m. I definitely wasn't arguing about betting flop, too wet, no equity but about potting the turn. April 11, 2019 | 3:57 p.m. 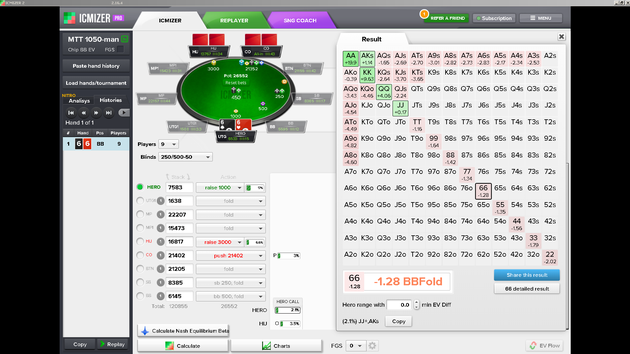 Comment | Risva10 commented on At how many BB's should I start folding here? Yeah you are right about deeper stacks. But really with JJ I will always minraise get it in for 15BB its not like you will see this spot come up often. I am opening from a 15BB stack UTG, I might get 3bet and get it in easiily. I think its too good of a hand to push 15BB UTG with. Also MP might be 3betting some 99, TT maybe even 88. I generally play tight so from a 15BB stack UTG I might raise fold some good blocker hands like KQo, ATo, depending on the table image I've given myself the past hands and if there aren't many regs on the table.This way I can raise call some AA, KK, QQ, maybe JJ. But anyway it was some massive BIGGER tournament on a Sunday, I think you should definitely be minraising some of these. April 11, 2019 | 3:30 p.m.
My bad seems like the resolution is not the same as in my pics. Anyway yes when I add AQo in villains range that happens. Probably because the total combos of unpaired hands (both for 3bettor and shover) is much higher than paired ones so you should be flipping a lot. I cant find another reason. April 10, 2019 | 3:35 p.m.
Hand History | Risva10 posted in MTT: 99 on BBvsUTG1 open 22BB deep. April 10, 2019 | 2:44 p.m.
April 10, 2019 | 2:38 p.m. Pretty unusual spot though, opening from a 15BB stack UTG and getting that much action I should probably be more cautious. This is if LJ is 3betting 99+, AJ+, KQs and CO 4bets JJ+, AK+. April 10, 2019 | 2:22 p.m. It seems like I might had made a mistake on the ranges, just look how much more JJ make when I add AQ on villain's shoving range (1st picture). April 10, 2019 | 2:14 p.m. Comment | Risva10 commented on Folding 55 on A board facing small bet. Just fold if he was playing tight or shove if he is playing loose/ folding to 3bets a lot. Your stack is too small to flat that, you are putting in 1/8 of your stack with a hand that plays terribly postflop, especially if someone else flats which you should expect. This deep its not worth it, cause hitting a set is rare and there is not enough money to be made. On K, Q, A high flops when he cbets you will have to guess if he has it which is bad. As played you can't call when he cbets into 4 people cause his range should be stronger than usual. April 10, 2019 | 1:44 p.m.
Do you generally just attack these boards vs any range? VS BB for example or cause in this situation its a limp/ caller ? April 10, 2019 | 1:28 p.m. If he has some Qx on his flop x range, which he should 3way, doesn't this play become questionable? Especially 30BB effective where you could be flatting AQ. Also I don't see them calling the flop bet with underpairs 3way. Do we just want to take the pot right now? And we might get x/r by AK with a spade or something and have to fold right away with our J.
April 10, 2019 | 1:18 p.m.
Also at 47:30 A5o defend. Wouldn't it be an okay fold since you are second in chips, this hand plays pretty bad post, there are quite bit of implied odds and he has definetely shown he can put the pressure on? Would you be folding A6o ? April 7, 2019 | 5:54 a.m.
16:10 The 44 hand. I don't think the equity advantage is this big here BUvsBB as on the QT8 board UTGvsBB. Your range is definetely wider so I would think you have plenty of other hands to bet with on this one. Is just giving up with a hand like this not a thing? Also I think he can call much wider on this board and can lead on some turns with hands that would be instafolds on the QT8. Just making some intuitive assumptions I am not experienced with PIO, this series has helped quite a bit though! April 7, 2019 | 5:20 a.m.
8:25 you open A4o BTN, would you be peeling the turn bet with AQo since he is betting almost always after you x OTF or is it not worth it? 25:00 Defending the BBvsBU, if your hand was 97 of clubs what would you do? I would probably be x/r sinse he will be betting really wide but is there any reason to be x/c with that kind of hand? Great work anyway, really nice run through the sims. April 7, 2019 | 3:51 a.m.
Shouldnt we lean more towards calling cause ICM and cause this flop is not one that Villain will bluff/auto-cbet a lot on? I dont think this is a flop that he will try to apply a lot of pressure on especially at a full FT.
April 6, 2019 | 4:56 a.m.